For as long as life goes on, stains will as well. It’s inevitable that you will find yourself with a stain. Coffee stains are some of the most common stains we encounter at Marky’s Dry Cleaners in Denton, Texas. A coffee stain can be a real pain to deal with. Stain removal techniques have to address tannin,protein, possibly sugar, animal fat in cream, or non-dairy creamer. Coffee alone is a natural dye. When combined with other ingredients like sugar and cream, it is much more complex. If the stain is fresh and is coffee only, it’s fairly easy to remove. If the stain has dried, has sugar, or has been ironed, it makes removal much more difficult. On some light fabrics such as wool or cotton, or if the coffee includes sugar or cream, usually multiple attempts are needed. Here’s our advice on How to Remove Coffee Stains. Oh No, I spilled coffee on my shirt! Customers most frequently inquire about stain removal on their clothing. From Dress Shirts, to Silk Blouses, coffee loves to find it’s way onto your clothes, especially right before you head to work. If you’re running short on time, you may opt to just change into a new shirt. It’s always best to treat a stain immediately for the best possible chance at removal, but we understand that life happens. Determine if the garment is Dry Clean Only or machine wash. If Dry Cleaning is recommended based on the care label, do not put anything on the stain and take it immediately to your Dry Cleaners. Try to absorb as much of the excess liquid as possible. Do not rub vigorously…just soak up as much of teh spill as possible. Skip the rest of the following steps and head to your dry cleaner right away. If you added any sort of dairy in your coffee like milk or cream you will need to use a laundry detergent that contains enzymes. Launder the item, and if safe for the fabric, use a chlorine bleach. Oops, I spilled Coffee on the couch! Coffee stains on Upholstery is an even bigger pain that a simple spot on your shirt. Since we can’t throw the living room sofa or Grandpa’s old recliner in a washing machine we have to take a slightly different approach. Make a solution of one tablespoon liquid dish detergent and two cups of clean, cool water. Obtain a clean white cloth and sponge a hidden area for colorfastness. If no color appears on the cloth, move to the coffee stain and sponge. With a new white cloth, sponge cold water onto the area to help “rinse” the stain. Blot with a dry cloth to dry the area. What if it’s in the carpet? Besides hauling out the heavy machinery, (big ol’ carpet shampooers which may do more harm than good) there is a way to treat Java on the floor. Blot up as much as you can with a dry cloth, try using a pinching motion like you would to add a pinch of salt to your cooking, as simply applying pressure can push the coffee further down the fibers and possibly into the padding. You definitely want to avoid getting the padding wet as the stain will wick back up into the fibers, over time making the stain reappear. Use plain water and a white cloth first and sparingly sponge the stain. When the fibers start getting more than damp, blot up the moisture with a dry white cloth. This is to avoid too much liquid on the carpet, again to protect the padding. If the stain isn’t budging, use a solution of one tablespoon liquid dish detergent and one tablespoon of white vinegar to two cups of water. Just like in step 2, dab a little solution on the stain, then blot dry. Continue until the stain disappears. Use plain cold water and dab the area, then blot dry to “rinse” the dish detergent/vinegar solution out of the carpet. The Good Housekeeping Research Institute also suggests a commercial stain remover known as Wine Away as an effective treatment for coffee stains. Follow application instructions on the bottle and always test an inconspicuous area first. Always remember, If the garment is Dry Clean Only, take it to your local Dry Cleaners like Marky’s Dry Cleaning Delivery Service where Professionals will get the job done right. Get Help With All Your Spots From Marky’s Dry cleaning delivery service. Don’t Know What That Spot is or How to Get It Out? Call 940-323-2200 for assistance or visit any of our three locations. The decision to clean and preserve your wedding dress is very important. Whether you’re hoping your dress becomes a family heirloom or you expect to wear it again yourself one day, understanding the delicate nature of your special garment may help make the decision a bit easier. In normal wearing, skin oils and perspiration are absorbed into the fabric – wine, champagne or other sugary beverages may have even spilled on your dress; these organic compounds will undoubtedly damage the fabric if they are not neutralized or properly removed. Here at Marky’s Dry Cleaners, we uphold the importance of having your bridal gown professionally cleaned before being stored long-term. In fact, in addition to cleaning, proper storage is vital to the overall safety and security of such a special garment. Scientific research proves that archival materials can protect delicate fabric from age and decay. For these reasons, we strongly advise against having gown vacuum-sealed as plastics are used. Instead, the preservation process must ensure that your gown be wrapped in acid-free materials before being placed in an acid-free textile storage box. The box should be stored in an area where temperature and humidity levels are as constant as possible, preferably in a closet that is located on an interior wall; attics or basements are not appropriate locations for storage – in fact, spaces that are in close proximity to heating or air conditioning vents, pipes and even spaces that are exposed to direct sunlight should be carefully avoided. Upon storage, about every 2-3 years your box should be opened and your gown inspected. But brides remember, always wash your hands with a small amount of baking soda and warm water before handling this precious garment or wear cotton gloves. At Comet Cleaners of Denton Texas we follow the guidelines recommenced by the Smithsonian Museum in Washington DC. This is just the final detail that protects all of your wedding day memories and guarantees your gown’s perfect preservation for years to come! Doing laundry has been a common household activity for years. Whether the techn­ology­ was­ beating the garments on rocks by the river or pushing buttons on programmed washing machines, this process depends on water and a mechanical action usua­lly assisted by soap. Dry Cleaning uses the same washing machine principle but replaces the water used at home with a cleaning solvent. 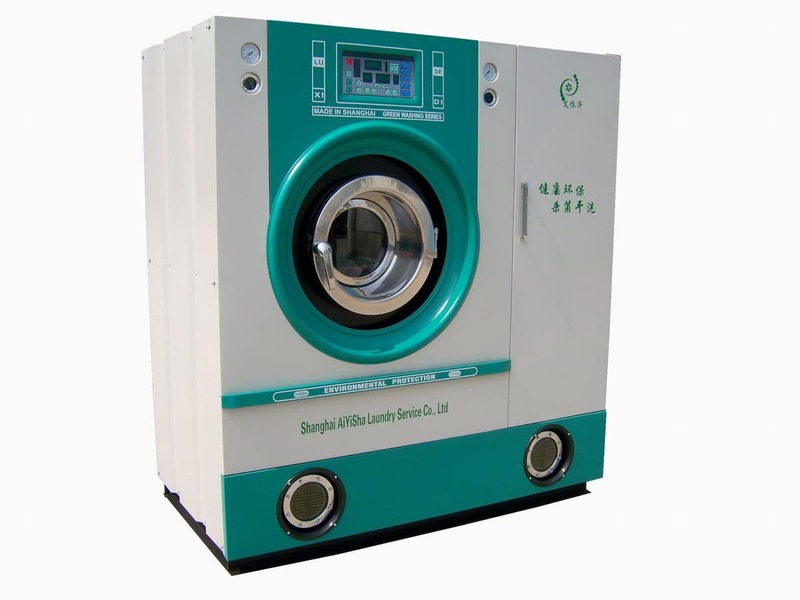 The modern dry cleaning machine is generally a “dry to dry” machine like the one above. That means the clothes go in dry, are cleaned as in your home washer and then dried as in your home dryer. The primary difference is that as the cleaning solvent evaporates during the dry cycle it is condensed and returned to the storage tank at the bottom of the machine. The solvent is continuously filtered to remove soil, dye, oils and other “dirt” from the clothes. A variety of solvents are used. At Marky’s of Denton Texas we use a petroleum solvent. Safe, gently and environmentally friendly it cleans well without the health risks of other chemically engineered solvents. Dry cleaning allow us to cleaning many natural and synthetic fibers without the risk of damage or shrinkage that would otherwise occur if washed in water. It is generally much gentler and keeps your clothes looking new much longer. A real benefit when you find something that you really like to wear and want to keep it around for a while. Found in vegetables like potatoes and corn, starch is a very versatile substance. Anyone who has dropped off dress shirts at the Dry Cleaners like Comet Cleaners in Denton Texas knows a little bit about starch. They know there’s the option of no starch, light starch, medium starch, heavy starch and extra heavy starch (Cowboy Starch). What kind of starch do you choose? There are both pros and cons to starching clothing, and not all clothing will react to being starched in the same way. 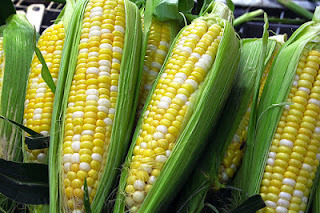 Corn Starch is a natural starch derived from the endosperm of the corn kernel. It’s fine texture in powder form make a paste when mixed with water. This natural ‘glue’ sticks to the fibers of your shirt offering resistance against wrinkles when worn. It is a water soluble starch and will eventually wash out of your shirts. The drawback of corn starch is that the particles are rather small and a large percentage of starch added to the clothing is rinsed away in the rinse cycle. Wheat starch is also a natural starch that has a “glue-like” consistency. It is the starch of choice for most commercial cleaners who use natural starch since it sticks to fibers better than corn starch. Since the particles are larger microscopically, they are able to be caught and entwined in the fibers of the shirt with less being wasted in the rinse cycle. Synthetic Starch, also known as poly vinyl chloride or PVC is basically a plastic polymer. The particles are larger, like wheat, so they stick well to the fibers and less rinses away. During pressing of the shirt, heat is applied to the fabric which melts the PVC and bonds it semi-permanently to the fibers. This encases the fibers with a layer of plastic and keeps the individual fibers extremely rigid. This is fantastic for a crisp looking shirt that resists wrinkles well. It does wash out over time. Synthetic starches can also be made from a combination of difference natural starches with added plasticizers. Here at Comet Cleaners in Denton Texas, we use the finest combination of natural and synthetic ingredients in our starch to make your shirt perfect every time. By combining, we are able to reap the benefits of both. Our starch features the consistency of natural starches with the staying power of synthetics. May reduce the lifespan of clothing by stiffening fibers. When fibers come into contact with anything else, they offer more resistance and can fray or break. Know what type of starch is currently being used on your clothes. Do not over starch shirts if you intend to keep them in usable condition for a while. Starch of any kind will coat the individual strands of a shirt. Dark shirts do not respond well to starches and will begin to develop a “shine” if overly saturated. If you have any questions regarding starch, take your shirts to a Professional Dry Cleaners. Cleaning a Christmas Tree Skirt, regardless of the fabric composition, is a tricky process. If done improperly, it can result in disaster. The Professional Dry Cleaners here at Comet Cleaners in Denton Texas have been cleaning Christmas Tree Skirts for over ten years and have perfected methods based on what it’s made of. Felt cannot be cleaned the same way as silk, cotton cannot be laundered if it’s on a skirt with embroidery thread, etc… For the best possible results, we recommend taking all tree skirts to a Professional Dry Cleaners. 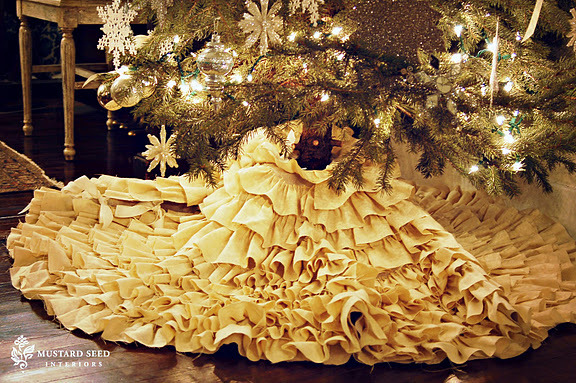 As all materials are treated differently, there is no one way to clean a tree skirt. We NEVER suggest cleaning one yourself. If you insist on trying, be sure to test out anything on a hidden area to avoid completely ruining the skirt. Felt is prone to shrinking and fading and must be handled carefully. Dyes are rich in tree skirts. They can easily bleed onto other fabrics. Never attempt to clean a tree skirt that is lying on carpet. The dye leakage could result in a permanent stain on your carpet. Do not attempt to clean if there are both dark and light colors, like red and white. Always follow the care label. Most will say Dry Clean Only. If there is no care label, err on the side of caution and take it to a Professional Dry Cleaners who holds a Certification in Dry Cleaning and a Certification in Wet Cleaning. This ensures that any cleaning will be properly handled. If you have pets, check you’re skirt often. Animals seem to love using tree skirts as potties. 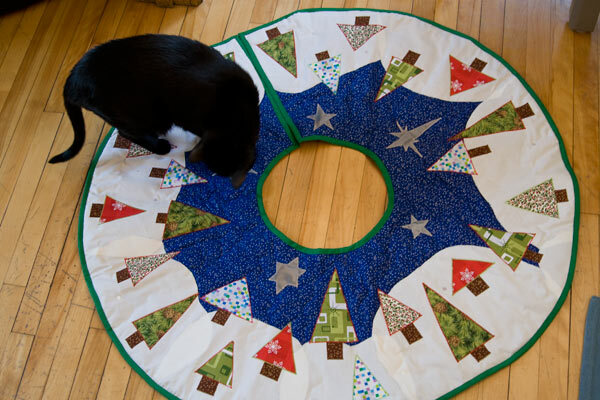 We know all kitties love Christmas, but when they potty on a tree skirt it’s time to pause the festivities and deal with the stain. The ammonia in urine can cause the dyes of the fabric to run and stain anything underneath. You also face the tree skirt itself being ruined. Should you notice a spot, take to your dry cleaners immediately.